It ended with haymaker after haymaker — both literal and proverbial — from Sidney Crosby and the rest of the resilient Pittsburgh Penguins. The defending champions provided an emphatic reminder of why they’re on the cusp of history with a 6-0 demolition of the Nashville Predators in Game 5 of the Stanley Cup Final to take a 3-2 lead. Pittsburgh will have a chance to become the first franchise to win back-to-back championships since Detroit in 1998 when the series shifts back to Nashville for Game 6 on Sunday night. One that can’t get back to the creature comforts of Smashville fast enough. The Penguins chased Pekka Rinne with a three-goal barrage in the first period and kept it going against backup Juuse Saros to push the Predators to the brink of elimination for the first time during their run to the final. All the good mojo Rinne generated while helping Nashville rally to tie the series at 2 vanished in a span of 20 minutes. Justin Schultz beat Rinne just 91 seconds in , Bryan Rust and Evgeni Malkin followed before the first period horn sounded, continuing Rinne’s baffling inability to play effectively in Pittsburgh during the series. Rinne has stopped just 34 of the 45 pucks that have come his way during seven forgettable periods at PPG Paints Arena. “It was just one of those games where they were going and we were trying to find it and didn’t really get it going at any point,” Rinne said. Not that the Penguins gave them much of a chance. Conor Sheary, Phil Kessel — just as linemate Malkin predicted — and 35-year-old playoff newbie Ron Hainsey also scored for Pittsburgh. It was Crosby who sent the message — with his vision, his creativity and, oddly, his fists. The two-time MVP’s eventful night included becoming the franchise’s all-time leading scorer in the Stanley Cup Final, a two-minute roughing penalty for trying to dribble Nashville defenseman P.K. Subban’s head on the ice near the end of the first period and what he said was an inadvertent flip of a water bottle onto the ice during play. “I think Sid really understands the opportunity that this team has and he’s not taking anything for granted,” Penguins coach Mike Sullivan said. And apparently not taking any more stuff from Subban either. The two stars became tangled up behind the Nashville goal late in the first with Crosby on top. 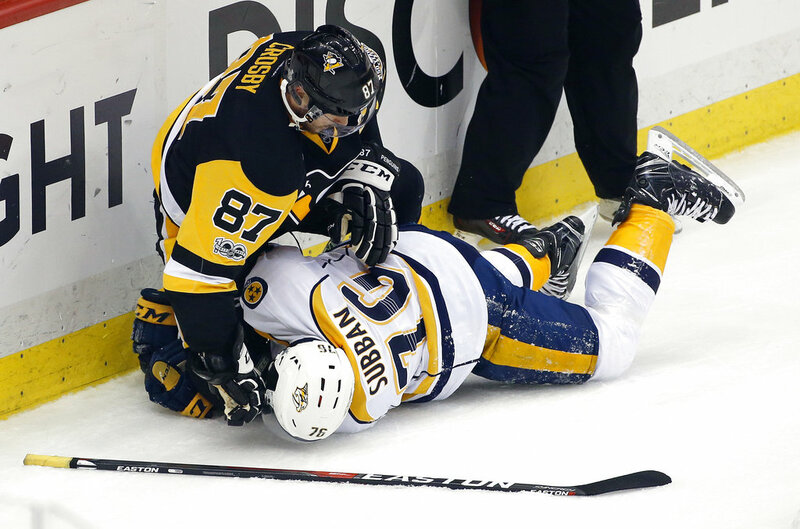 He attempted to extract himself but couldn’t, then unleashed a torrent of punches at Subban’s head. Subban, who claimed Crosby was complaining about Subban’s breath during a Game 3 run-in, just kind of sat there and took it. The exchange ended with both players heading to the dressing room with minor penalties. They watched on TV as Malkin’s wrist shot with 10 seconds left in the first gave Pittsburgh a 3-0 edge it never came close to giving up. “That is, hands down, the best game that we’ve played in this series to this point,” Sullivan said. The Predators are 9-1 at home in the playoffs, a place they will need to be a haven once again if they want to extend their improbable Cup run back to Pittsburgh. NOTES: Matt Murray finished with 24 saves. … Crosby now has 20 career points in the Stanley Cup Final, a new franchise record and one more than team owner Mario Lemieux. … Crosby also moved into a tie with Denis Potvin for 19th on the all-time career playoff scoring list. … The team that has won Game 5 in a 2-2 series has gone on to win the Cup 71 percent (17 of 24) of the time since 1939. … The teams combined for 100 penalty minutes (58 for Nashville, 42 for Pittsburgh). … Guentzel’s assist moved him into a tie with Dino Ciccarelli and Ville Leino for the most playoff points by a rookie in NHL history (21). … Penguins F Nick Bonino missed his third straight game with a lower-body injury. … Nashville F Colin Wilson made his series debut after missing the first four games with an undisclosed injury. Wilson skated on the fourth line with Frederick Gaudreau and Harry Zolnierczyk.